Algerian born Enrico Macias received a warm welcome in Morocco, where he performed for the first time, Jan 26, in Megarama complex in Casablanca. “I am deeply touched. I have performed in many countries, but I have never seen such a warm welcome as in Morocco,” said Macias. He added that Morocco reminded him of Andalucia where a melting pot of cultures and religions coexist with one another. Macias's latest album 'Oranges amères' reflects his nostalgia towards his homeland. “Nostalgia is a theme that prevails in most of my song, and my latest Album talks about this,” said Macias. “When I hear at the airport about passengers going to Constantine, I get sad, but I am confident that I will come back to Algeria one day,” added Macias. Enrico Macias, whose real name is Gaston Ghrenassia, was born on Dec. 11, 1938 in Constantine, Algeria, to a Jewish family. He had a normal schooling, but also enjoyed music, particularly the guitar. His father was a violinist in the orchestra of Cheick Raymond Leyris, the great master of Maalouf, the Arab-Andalucian music unique to Constantine. At 15, young Gaston was already a member of this prestigious orchestra, and soon became the heir-apparent to Cheick Raymond. After finishing his studies in 1956, Macias applied for a post as a supervisor in a school. He did not stop, however, playing the guitar. In June 22, 1961, Cheick Raymond was killed in Constantine. Young Gaston realized that exile was the only solution, and that he had reached the end of an epoch. In 1961, he embarked on the "Ville d'Alger" for a new life in France, along with his wife Suzy, who was the daughter of Cheick Raymond. Leaving Algeria was a heart-breaking experience for him. Arriving in Paris, he decided to take up a musical career. As a child prodigy of Maalouf music, he had to adapt to French tastes. He attempted to translate parts of the ethnic Maalouf music into French, but was not satisfied with the results. So he built up a personal repertoire based on his own experiences. With Raymond Bernard of Pathé, he recorded his first album "Adieu mon pays". The words went “I've left my country, my house, my family and friends”. In October of the same year, he appeared on a television programme, 'Cinq colonnes à la une', reporting on the French citizens repatriated from Algeria, and "Pieds noirs" ("black feet" - because they wore black shoes) as they became known. This was the start of his fame. In 1963, he began singing in public and made his first tour with Paola and Billy Bridge. He ended up starring with songs, such as "Enfants de tous pays" and "l'île du Rhône". Running against the tide of Beatlemania, Macias witnessed a huge success. In 1964, he performed in the first half of the “Compagnons de la Chanson show” at the Olympia in spring. He then went on tour in France, as well as in Lebanon, Greece and Turkey, where he sang "Paris, tu m'as pris dans tes bras" and "les Filles de mon pays", which later became hits. Although his original fans were the Pieds Noirs who recognized themselves in Macias' songs and saw him as a representative of their community, he also appealed to the general public, and his songs were liked by everyone. In 1965 he was awarded the Prix Vincent Scotto and composed "les Gens du Nord" and "Non je n'ai pas oublié". The following year, he sang before 120,000 people at the Dinamo Stadium in Moscow. He also recorded songs in Spanish and Italian. He was awarded a golden disc for his album "Melisa", for his beautiful song "Malheur à celui qui blesse un enfant". In addition to a series of concerts at the Olympia, he made a big tour in Japan, Israel and France. In 1978, he was invited to Egypt by President Anouar El Sadate. He sang before 20,000 people in the pyramids. His message was that of peace, with songs like "Aimez-vous les uns les autres". The then Secretary General of the UN, Kurt Waldheim, awarded the singer the title of "Singer of Peace" in November 1981, after the singer had donated his royalties on "Malheur à celui qui blesse un enfant" to UNICEF. This international recognition made the signer's success a personal one too. He brought out two more titles on the Trema label, his new recording company: "Juif espagnol" and "le Mendiant de l'amour". In March 1985, Enrico Macias was awarded the Légion d'honneur, by French Prime Minister, Laurent Fabius. His attachment to universal values such as peace and solidarity between peoples brought him a prestigious nomination in 1997, that of "Ambassador at large for peace and protection of children" by Kofi Annan, the UN General Secretary. Enrico Macias played a concert to pay tribute to Cheick Raymond, his early master, at the “Festival of the Printemps de Bourges” in April 1999. He became determined to bring the Jewish-Arab culture back to life through his music. 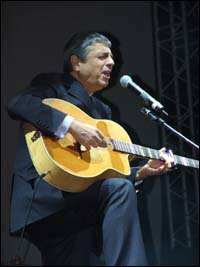 In March 2000, Macias announced his desire to return to his homeland and play a series of concerts for Algerian fans. However, given the volatile political situation in Algeria, his bold project soon whipped up a storm of controversy. The Jewish singer declared his tour was motivated by a profound desire for peace and many saw the Algerian president's support as a sign of the country opening up after many long years of repression. However, Macias was disappointed, because the tour dates were finally postponed for security reasons. Nonetheless, the singer remains firmly committed to the idea of returning to perform in his homeland one day. This event motivated him to cooperate with Florence Assouline and write a book about his experiences. "Mon Algérie", published in October 2001, reflected a "real love story between one man and his homeland". At the beginning of 2003, Enrico Macias released "Oranges Amères", his latest album produced by his son Jean-Claude Ghrenassia. Featuring the singer's come-back to the eastern sounds of his early career, the album also proposed lyrics conveying a pacific message. Also entitled "Oranges Amères" and penned by Marc Estève and Art Mengo, the first track set the subtle mix between tradition and modernity that ran throughout the rest of the album. Macias performed many concerts in France and other countries in 2004 to promote his latest album "Oranges Amères".